According to data from comScore, in the past 24 months 50 million Americans became Android phone users. In the same time frame Apple added 24 million iPhone users. As I mentioned in my Asymmetric Competition post, it would be unwise to consider this data in isolation. Consider the following graph showing the net change in users in the US. Android and iPhone grew mostly at the expense of non-smart users. The BlackBerry lost 8.1 million users and all the others only lost about 4.5 million. 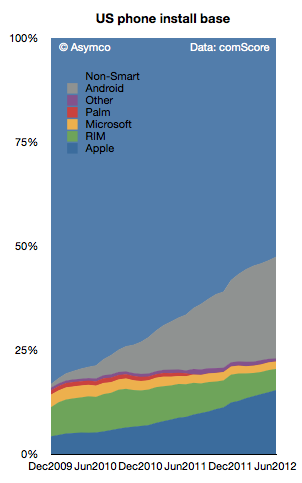 With penetration at 50% it’s still impressive that there is so little “churn” between platforms. In fact, measuring churn as the net platform user loss as a percent of all smartphone users, we get something less than 1% per month. The smartphone competition is still primarily with non-consumption. That will change at some point when smartphone penetration (shown below) will begin to saturate. The basis of competition will have to shift from converting non-smart users to converting users of other platforms while maintaining one’s own user base. The market has not experienced this sort of rivalry on a wide scale. 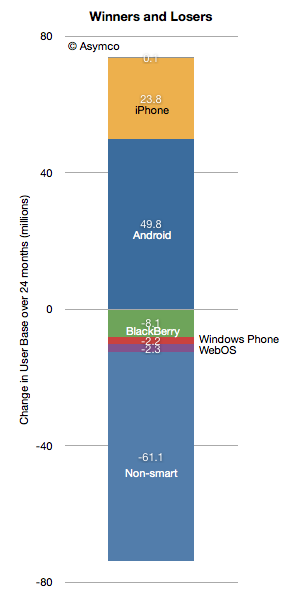 The defections of BlackBerry and Symbian users are relatively rare events. › Next Post How many iPhone “5''s will be sold?